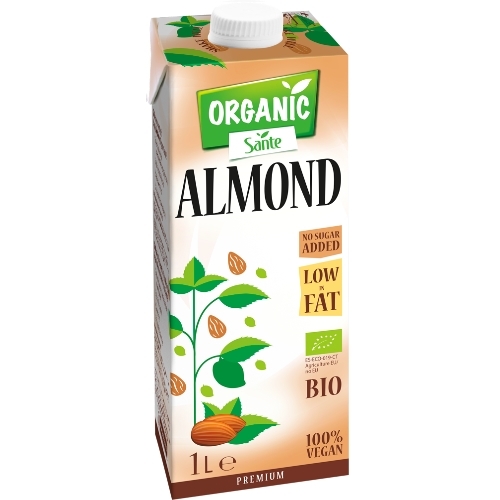 Organic Sante almond drink with no added sugar is a drink 100% of plant origin, which delights with its creamy consistency and mild almond flavour. It is produced from organic almonds of the highest quality and has the BIO certificate. It contains naturally occurring sugars. Organic Sante almond drink with no added sugar treats wonderful by itself. Ideal added to coffee or tea (instead of milk and syrup) and for cocktails. Sante breakfast cereal, FIT cereal, Muesli, Crunchy and Granola with the plant drink make a really delicious and nutritious breakfast. Ingredients : Water, almond * (3%), emulsifier: lecithin (sunflower); sea salt. *From organic farming. Agriculture EU / no EU.